Or did he? Psalm 106 tells the story a little differently. “Pinkhas stood and prayed,” says the Psalm, “and the plagued ceased.” Was King David taking liberties with the facts to elevate the reputation of Pinkhas? Is Pinkhas really such a hero? He killed two defenseless people. An extreme story, yet one to remember. The goal of many a war is peace. World War 1 was supposed to make the world safe for democracy, so in World War 2 we used to wisecrack that we were fighting to make the world safe for peace. Sorry, folks. That didn’t happen. Ink on the peace treaties of 1945 was scarcely dry before Arab armies attacked the new State of Israel in ’48, Communist forces fought their way to ruling China in ’49, and other conflicts followed. 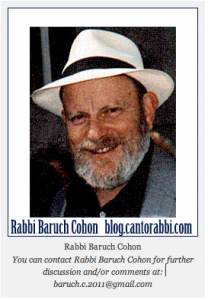 This entry was posted in Jewish Blogs and tagged Balaam, Book of Numbers, diplomacy, Israel, jewish, Jewish Blogs, Midian, Moses, Pinchas, Pinkhas, Rabbi Baruch Cohon, Torah, Torah Blogs, Torah Study. Bookmark the permalink. My opinion is that Pinkhas did the correct thing. We will never know what steered him into doing that act. Perhaps the good Lord spoke to him. Whatever the reason, it corrected what was going on with the Israelis. We too, today, have to be shocked into action many times to correct injustice among us. There are many forms of reward, and sometimes we don’t recognize the reward. If we truly believe that Adonai is wiser than us, and live by His rules and laws, more times than not we will survive well.